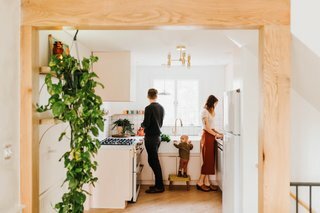 A husband-and-wife duo work their magic on a tired 1950s residence, unveiling a contemporary home with midcentury influences. 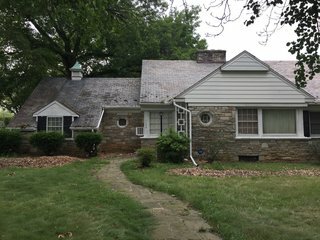 When Claude’s husband, Chris, came home with the news that he had purchased a foreclosed home just outside Lancaster City, Pennsylvania, she had some serious reservations. "He pulled up some photos from Google Maps and I came to a rather prompt opinion that I was not impressed," Claude says. "It was ugly." Yet her tune changed after her first walkthrough of the house. 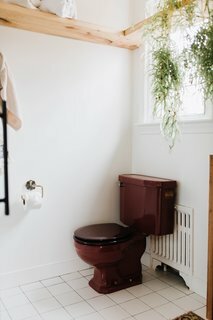 Despite the property’s neglected state, distracting tile choices, and abundance of "ugly stone," Claude fell in love with the home’s original 1950s elements—even the maroon toilet and matching sinks. The old wooden ceiling beams in the dining room were purchased from a local Amish farmer and painted white. 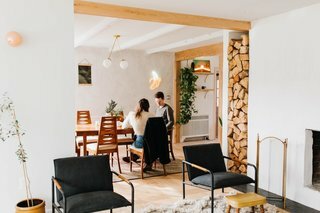 Warm timbers tie the home together. 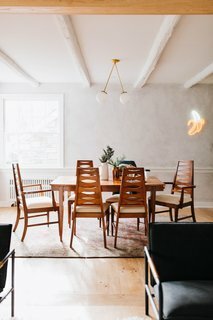 Eager to breathe new life into the house—dubbed Louise Avenue—and stay true to the era of the home, the couple tapped their team at the design and real estate firm Chris & Claude Co. to embark on a renovation that took over six months and approximately $132,000 to complete. The kitchen is one of Claude's favorite parts of the home. 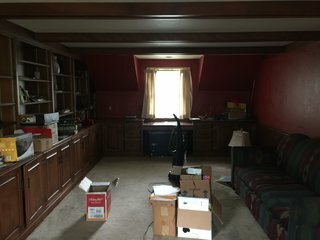 The team purchased stock cabinets that were professionally painted by a local Amish man and added wooden floors to match the rest of the house. 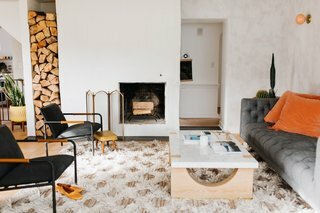 The transformation of the dated property in a midcentury-inspired, light-filled home that radiates warmth and effortless cool has been nothing short of stunning—a fact reflected in the multiple offers put on the home and the speedy sale in just two days. "The house was overall in pretty bad shape" Claude says. "We saved original items when they were salvageable and re-worked them into the design." 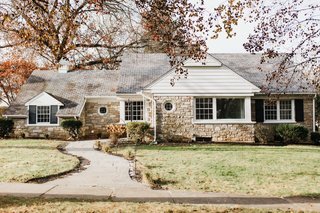 "The neighborhood is full of beautiful homes left untouched through the last century, and we didn’t want to do anything to the exterior that would change that timeless feel," Claude explains of their approach to the exterior, which was given a fresh coat of paint. The stone surrounding the fireplace was one of Claude's least favorite aspects of the original house. 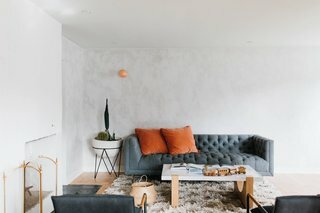 Some of the living room walls were painted with a gray lime wash by Portola Paints, while other walls were finished with Nebulous White by Sherwin Williams. 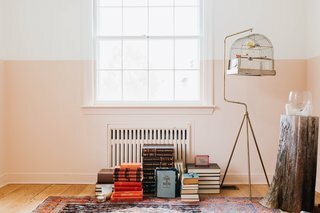 The pink, wall-mounted light is from Anthropologie. Chris and Claude put stucco on top of the fireplace's outdated stone. 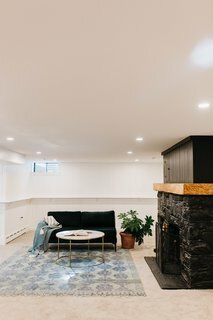 The living room's new expansive feel was achieved through the removal of select walls. 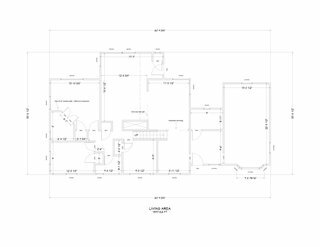 The home originally came with orange countertops. 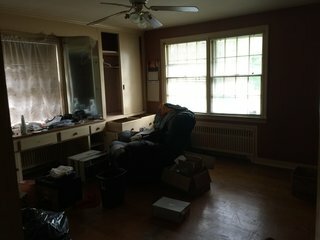 The laminate floors were ripped up, but the wood beneath couldn't be salvaged. 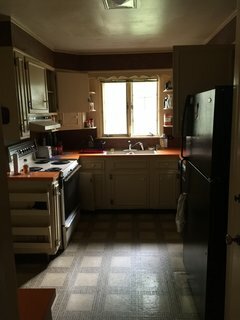 The orange countertops were swapped for custom concrete countertops. 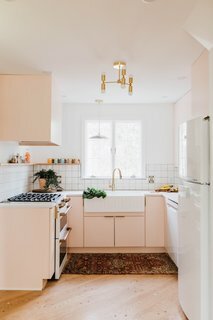 The cabinets were painted Pink Ground by Farrow & Ball and paired with Build.com hardware. The kitchen sink and faucet are from Amazon, while the tile is from Lowes. The pendant light is by Pepe & Carols while the banana light is from Urban Outfitters. The table and chairs were a thrifted find as was the antique rug. 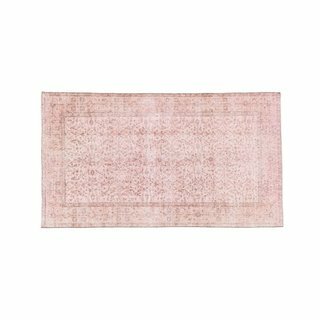 One-of-a-kind vintage rug, handwoven and hand-knotted in Isparta, Turkey Dimensions: 3'9" x 6'8" (116 cm x 205 cm) All rugs have been professionally cleaned; age-related wear and natural inconsistencies are inherent in these unique, handcrafted vintage rugs. 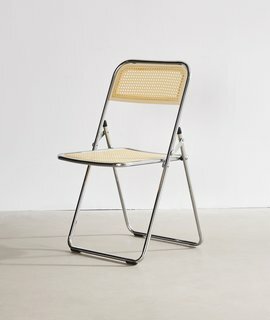 Retro-inspired folding chair with woven cane accents at back + seat. With a folding iron structure in a shiny finish and looped construction. Assembly required. 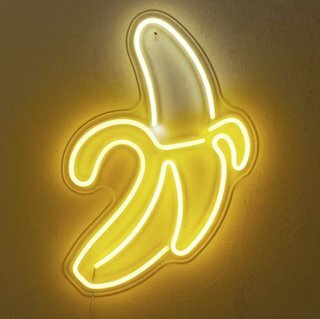 Get your daily dose of potassium with this banana-shaped neon light! In an easy plug-in design mounted to a clear acrylic back that sturdily mounts to the wall. 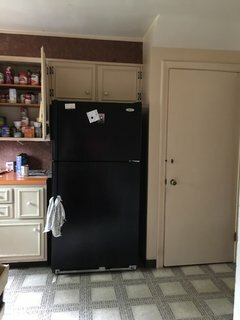 Requires 2 screws for hanging - not included. 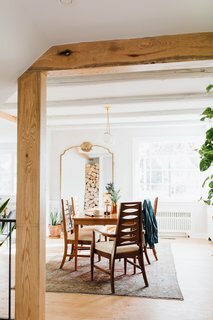 "We loved how the dining room turned out a bit moody, a bit retro, and a bit beautiful," Claude says. The original bedroom was wrapped in dark-colored surfaces. 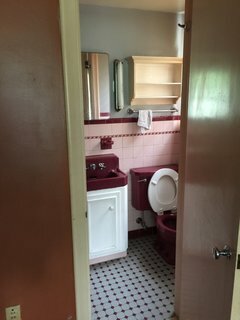 The master bathroom was very small and came with a maroon toilet and a matching sink that the team decided to keep, although the white toilet lid was swapped. As with all the bedrooms, the master bedroom was painted Chantilly Lace by Benjamin Moore. The floors were also refinished. 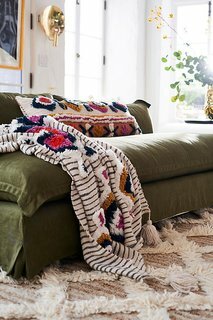 Kaleidoscopic tufts are an effortless way to get a just right bohemian vibe in your living or bedroom. 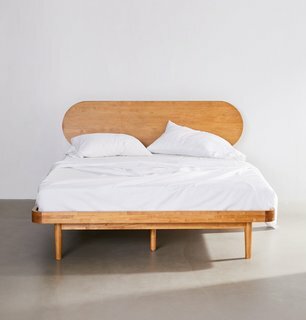 Minimalist bed frame crafted from wood in a natural finish. Part of our Camila collection, this bed features a clean, oval headboard and raised, platform construction, set on tapered legs for a mid-century modern look. Finished with a slatted base. 2 people recommended for assembly. 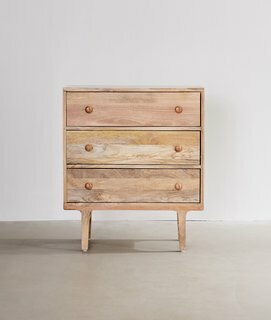 Part of our UO-exclusive Wyatt collection, this 3-drawer dresser is made from mango wood in India with a rustic, natural look. Perfect for organizing in small spaces, this dresser features arched legs and wooden knobs. 2 people recommended for assembly. 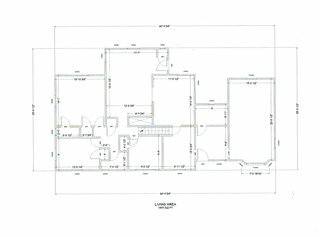 The new master bathroom was expanded. 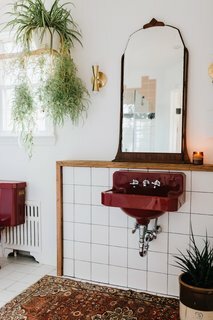 The maroon sink was moved to a new location and has a more sculptural feel. When Chris and Claude bought the home, the maroon toilet was mismatched with a white toilet lid. Although they couldn't find an exact match (even after five tries), the new lid is a much better match than the white. The tile was meticulously stacked, square upon square, to match the way it would have been installed in the 1950s. 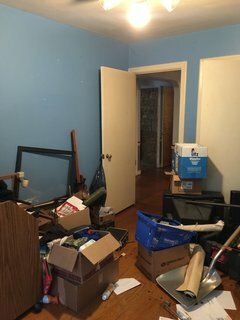 Purchased after foreclosure, the home needed a thorough cleaning before renovations. 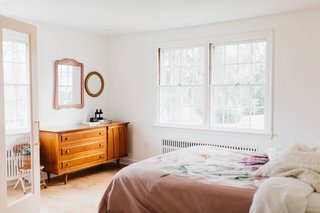 "We repainted this in Chantilly Lace by Benjamin Moore and Pink Ground by Farrow & Ball by carefully marking a line and switching out the color combos," Claude says. "We loved the funky aesthetic this gave the room, while adding a pop of classic color. " 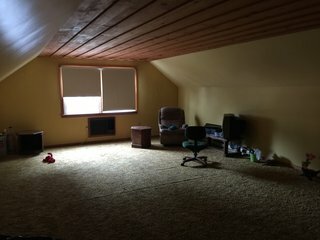 The wooden ceiling made the attic feel smaller than its size. A limited budget restricted what Chris and Claude could do to the attic, but they managed to refinish the floors, change the lighting, and repaint the walls Chantilly Lace by Benjamin Moore. 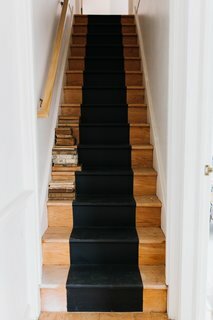 The runner for the stairs leading up to the attic were painted Dark Kettle Black by Valspar. The former studio was much darker than its new counterpart. 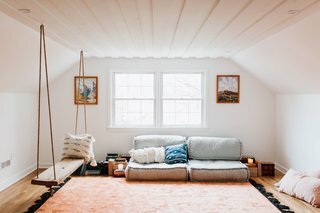 Claude shares: "We loved this studio conversion. 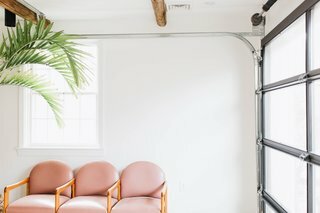 We added a black grid garage door so the owner could use it as a garage if they wanted, but also added a brand new HVAC system and polished concrete floors so it could be used as a studio space if needed." 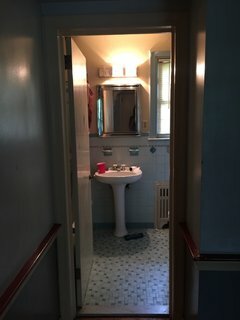 The hallway bathroom couldn't be salvaged, and the original tile was discarded. 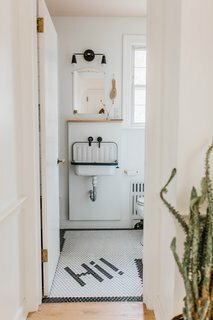 The updated hallway bathroom has a lot more personality with a Rejuvenation sink, a Wayfair faucet, and playful floor tile from a local tile shop. 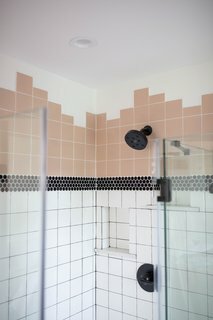 For a pop of color, the ceiling was painted Pink Ground by Farrow & Ball. 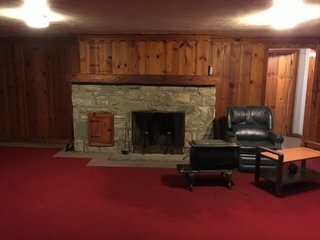 Dated wood paneling and stone surround were part of the original basement. The updated basement is much brighter thanks to new paint, carpets from Lowes, and new lighting. 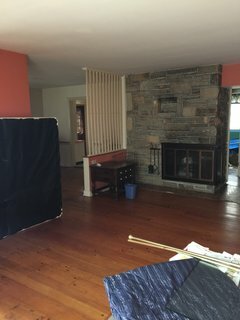 The fireplace was painted Dark Kettle Black by Valspar. 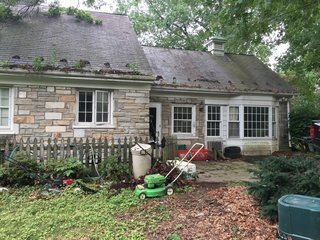 A look at the neglected backyard. After cleaning up the landscape, the team custom-made a few benches for the backyard and added gravel from Penn’s Stone Supply. 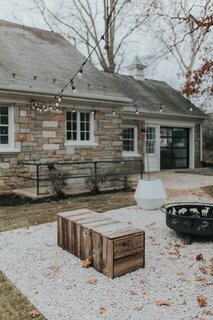 The string lights and West Elm Planters add a stylish touch. Have your own Before & After to share? Find out how to submit to Dwell.